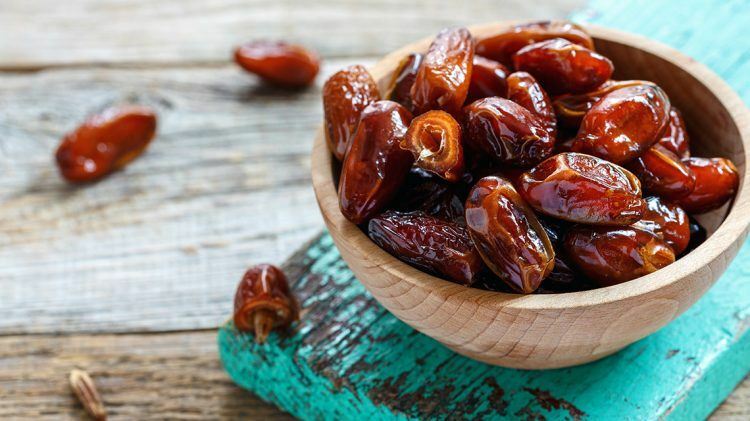 If dates aren’t an integral part of your diet yet, think again. Behind their sweetness hides a wealth of health benefits. They are packed with B-vitamins, vitamin A and K, essential minerals and fibre. Dates have been around for quite a while. They originate from Mesopotamia, modern-day Iraq to be exact, where people started cultivating them more than 5,000 years ago. Dates are a staple food throughout the Middle East. Outside of the Middle East, dates are most common in North Africa. Globally, Egypt and Iran are the main date producers. Dates grow on date palms and come in many different varieties. The most popular types are Medjool and Deglet Noor dates. Medjools are very sweet and moist. In comparison, Deglet Noor dates are less sweet, drier and more firm. Their health benefits are a common trait though – let’s have a look at some of them. Dates are rich in natural sugars that our bodies quickly digest and turn into energy. Hence, they are perfect to snack on before a workout or to fight off afternoon fatigue. Get ready for a refined sugar-free energy boost sponsored by Mother Nature. A sweet snack with a low glycemic index. Dates are rich in dietary fibre, which promotes good digestive health by normalising your bowel movements. Therefore, consuming sufficient amounts of fibre helps fight constipation, bloating and cramping. Dates contain minerals such as magnesium and manganese, which are vital to keeping our bones healthy. Thus, they can help prevent conditions such as osteoporosis. They support healthy weight gain. There are about 2,800 calories in 1 kg of dates. While that is a lot of dates, they are still quite rich in calories and carbohydrates especially. If you are looking to gain weight or build muscles, go for dates. No need to skip on the sweet snack, if you want to maintain your weight. Just watch how much you eat.